Basically gene therapy is an intracellular delivery of genomic materials (transgene) into specific cells to generate a therapeutic effect by correcting an existing abnormality or providing the cells with a new function. Different types of gene delivery systems may be applied in gene therapy to restore a specific gene function or turning off a special gene(s). The ultimate goal of gene therapy is single administration of an appropriate material to replace a defective or missing gene. The first human gene transfer was utilized in 1989 on tumor-infiltrating lymphocytes , and the first gene therapy was done on ADA gene for treatment of patients with SCID (Severe Combined Immunodeficiency Defect) in 1990. Although initially the main focus of gene therapy was on inherited genetic disorders, now diverse diseases, including autosomal or X-linked recessive single gene disorders (CF(Cystic Fibrosis), ADA (Adenosine Deaminase) -SCID, emphysema, retinitis pigmentosa, sickle cell anemia, phenylketonuria, hemophilia, DMD (Duchenne Muscular Dystrophy), some autosomal dominant disorders, even polygenic disorders, different forms of cancers, vascular disease, neurodegenerative disorders, inflammatory conditions, and other acquired diseases are targets of gene therapy. To date, thousands of disorders have been treated by more than hundreds of protocols of gene therapy. There are 2 major categories of gene therapy: Germline gene therapy and somatic gene therapy. Although germline gene therapy may have a great potential, because it is currently ethically forbidden, it cannot be used. ,, To date, human gene therapy has been limited to somatic cell alterations and there is a remarkable development in the field. There are different viral and nonviral vectors for gene delivery, but all gene therapy applications depend on the fact that the genetic material needs to be delivered across the cell membrane and ultimately to the cell nucleus. Each of the delivery systems has some advantages and disadvantages, and in this review we explain about all types of gene delivery systems briefly [Figure 1]. Somatic gene therapy involves the insertion of genes into diploid cells of an individual where the genetic material is not passed on to its progeny. Somatic cell therapy is viewed as a more conservative, safer approach because it affects only the targeted cells in the patient, and is not passed on to future generations; however, somatic cell therapy is short-lived because the cells of most tissues ultimately die and are replaced by new cells. In addition, transporting the gene to the target cells or tissue is also problematic. Regardless of these difficulties, however, somatic cell gene therapy is appropriate and acceptable for many disorders. The transfer of genetic material through an appropriate vector, which can be a viral or nonviral vector, into the target tissue is in vivo delivery. This technique is the least advanced strategy at present but potentially it might be the most useful. The problem of this way is insufficient targeting of vectors to the correct tissue sites; however, improvement in targeting and vector development will solve the problem. Adenoviral vectors have been isolated from a large number of different species, and more than 100 different serotypes have been reported. Most adults have been exposed to the adenovirus serotypes most commonly used in gene therapy (types 2 and 5). Adenoviruses type 2 and 5 can be utilized for transferring both dividing and nondividing cells and have low host specificity so can be used for gene delivery into large range of tissues. Adenoviruses are able to deliver large DNA particles (up to 38 kb),  but in contrast to retroviruses, as they would not integrate into the host genome, their gene expression is too short term. Natural and acute immunologic responses against adenoviruses have made their clinical application limited to a few tissues, such as liver, lung (especially for CF(Cystic Fibrosis) treatment), or localized cancer gene therapy. Although the risk of serious disease following natural adenovirus infection is rare and the viral genome would not integrate into the host genome, gene therapy by adenoviral vectors has caused serious bad side effects and even death of some patients. ,,, Recently, in addition to safety of these vectors, several essential genes have been deleted so that viral replication can only occur under control and also most of the viral genome is deleted to obtain sufficient space for 38 kb of transgene particles, this kind of adenoviruses are called "gutless" or "pseudo" adenoviruses. There are some problems in utilizing poxviruses for gene delivery because of their complex structure and biology, so further studies are required to improve their safety and to reduce the risk of cytopathic effects. However, other types of viruses are under investigation to date and recently, many more different virus vector systems are being developed. These are derived from vaccinia virus, human cytomegalovirus, EBV, but as mentioned earlier, problems, such as their mutagen and carcinogen properties and long-term maintenance, are major limitations in utilizing the viral vectors in gene therapy. Physical methods applied for in vitro and in vivo gene delivery are based on making transient penetration in cell membrane by mechanical, electrical, ultrasonic, hydrodynamic, or laser-based energy so that DNA entrance into the targeted cells is facilitated. Naked DNA alone is able to transfer a gene (2-19 kb) into skin, thymus, cardiac muscle, and especially skeletal muscle and liver cells when directly injected, , also it has been applied directly. Long-term expression has been observed in skeletal muscle following injection for more than 19 months. Single injection yields transgenic expression in less than 1% of total myofibers of the muscle but multiple injection would improve it. Although naked DNA injection is a safe and simple method, its efficiency for gene delivery is low so it is only proper for some applications, such as DNA vaccination. Hydrodynamic is a simple and highly efficient method for direct intracellular delivery of any water-soluble compounds and particles into internal organs. The efficiency of this simple method in vivo is higher than any other nonviral system. This method has been successful for gene delivery into rodent liver and expression of hemophilia factors,  cytokines,  erythropoietin,  and hepatic growth factors,  in mouse and rat but it has been successful only in small animals and not in human. Ultrasound can make some nanomeric pores in membrane to facilitate intracellular delivery of DNA particles into cells of internal organs or tumors, so the size and concentration of plasmid DNA have great role in efficiency of the system. , The most important limitation of the system is low efficiency of it, especially in vivo. All liposomes have 1 or 2 fatty acids and alkyl moieties that are 12-18 carbons in length, in addition to a positively charged polar head group hydrophobic groups, this hydrophobic structure causes the cationic lipids. Since the first monovalent cationic lipid, DOTAP, was synthesized by Felgner et al. in 1987,  hundreds of new cationic liposome/micelle systems have been reported for gene delivery in vitro or in vivo. The routine way to prepare a lipoplex is mixing the solution of plasmid DNA and liposome in a proper buffer. The gene delivery efficiency of liposomes is dependent on the size, structure, and even the amount of the liposome, the charge ratio between transgenic DNA and cationic liposome, presence of helper lipid, and the structure and proportion of it and cell type. For gene transfer in vivo, many complexes (in equimolar ratios) are used that the more general ones are Chol/DOPE (1:1), DOTMA/DOPE (1:1), and DOTAP/DOPE (1:1). Cationic polymers at first were introduced by Wu et al.1987 184 as PLL, the same year of synthesizing the first cationic lipids, and were further expanded by a second generation, PEI by Behr et al. in 1995. To date a variety of linear or branched cationic polymers have been synthesized, including PLL-containing peptides, endosomolytic peptides (histidine-rich peptides), fusogenic peptides, nuclear localization peptides (mono partite NLS(Nuclear localization signal), bipartite NLS, nonclassical NLS), proteosomes. However, PLL is still the most widely studied cationic polymer and has been used in a variety of polymerizations of lysine ranging from 19 to 1116 amino acid residues (3.97-233.2 kDa). While the molecular weight of the polymer increases, the net positive charge of it also increases and are therefore able to bind DNA tighter and form more stable complexes, totally. There is a relationship between the length of the polymer, gene delivery efficiency, and toxicity as the length of the polymer increases, so does its efficiency and its toxicity. , However, the efficiency of PLL-mediated polyplexes are low when the PLL is used alone so some conjugation agents are used to facilitate cellular uptake in vitro (as EGF(fibroblast growth factor) or transferring) or endosomal escape in vivo (as fusogenic peptides or defective viruses). Also the attachment of PEG to the polymer can prevent plasma protein binding and increase circulation of half-life of the complex. , Different homogenous PLL-conjugated peptides have been developed that have low toxicity, higher efficiency, and site-specific attachment of ligands used for cell targeting. ,,, The optimal peptide sequence contains 18 lysines followed by a tryptophan and alkylated cysteine (AlkCWK18). A variety of branched forms of cationic peptides with a lysine as branching point have been explored. PEI is the most important cationic polymer next to PLL. PEI is one of the most positively charged dense polymers, synthesized in linear (LPEI) or branched (BPEI) form, which have high transfection activity in vitro and moderate activity in vivo but the linear forms have low toxicity and high efficiency than branched forms. As PLL, conjugation of some agents, such as galactose, anti-CD3 antibodies and RGD motif-containing peptides can facilitate PEI polyplex cellular uptake. ,, Two advantages of PEI is that it forms toroidal polyplex particles, which are stable to aggregation in physiological buffer conditions, PEI also has a strong buffering capacity at almost any pH because of the great number of primary, secondary, and tertiary amino groups. One disadvantage of PEI is its nonbiodegradable nature  and its serious toxicity in vivo (in contrast to cationic liposome/micelle). There are conflicting associations between the gene delivery efficiency and PEI toxicity, such as PLL, the most active PEI is 25 k for BPEI and 22 k for LPEI. Unfortunately, due to this property there are some limitations in the application of PEI in nonviral vector in vivo delivery. More biodegradable cationic polymers, such as aminoesters have been explored that have less toxicity than PEI and PLL. However, as mentioned earlier, there are a variety of new cationic polymer groups but each of them have some advantages and disadvantages. The notable factors for in vivo application are toxicity and transfection efficiency. 1. Stone D. Novel viral vector systems for gene therapy. Viruses 2010;2:1002-7. 2. Katare DP, Aeri V. Progress in gene therapy: A review. I.J.T.P.R 2010;1:33. 3. Rosenberg SA, Aebersold P, Cornetta K, Kasid A, Morgan RA, Moen R, et al. Gene transfer into humans immunotherapy of patients with advanced melanoma, using tumor- infiltrating lymphocytes modified by retroviral gene transduction. N Engl J Med 1990;323:570-8. 4. Culver K, Cornetta K, Morgan R, Morecki S, Aebersold P, Kasid A, et al. Lymphocytes as cellular vehicles for gene therapy in mouse and man. Proc Natl Acad Sci USA 1991;88:3155-9. 5. Blaese RM, Culver KW, Miller AD, Carter CS, Fleisher T, Clerici M, et al. T lymphocyte-directed gene therapy for ADA-SCID: Initial trial results after 4 years. Science 1995;270:475-80. 6. Resnik B, Langer PJ. Human germline gene therapy reconsidered. Hum Gene Ther 2001;12:1449-58. 7. McDonough PG. The ethics of somatic and germline gene therapy. Ann N Y Acad Sci 1997;816:378-82. 8. Resnik DB, Langer PJ. Human germline gene therapy reconsidered. Hum Gene Ther 2001;12:1449-58. 9. Wolf E, Schernthaner W, Zakhartchenko V, Prelle K, Stojkovic M, Brem G. Transgenic technology in farm animals-progress and perspectives. Exp Physiol 2000;85:615-25. 10. Johnson-Saliba M, Jans DA. Gene therapy: Optimising DNA delivery to the nucleus. Curr Drug Targets 2001;2:371-99. 11. Jaenisch R. Transgenic animals. Science 1988;240:1468-74. 12. Smith KR. Gene Therapy: The Potential Applicability of Gene Transfer Technology to the Human Germline. Int J Med Sci 2004;1:76-91. 13. Hirabayashi M, Takahashi R, Ito K, Kashiwazaki N, Hirao M, Hirasawa K, et al. A comparative study on the integration of exogenous DNA into mouse, rat, rabbit, and pig genomes. Exp Anim 2001;50:125-31. 14. Torres M. The use of embryonic stem cells for the genetic manipulation of the mous. Curr Topics Dev Biol 1998;36:99-114. 15. Gordon JW, Scangos GA, Plotkin DJ, Barbosa JA, Ruddle FH. Genetic transformation of mouse embryos by micro-injection of purified DNA. Proc Natl Acad Sci USA 1980;77:7380-4. 16. John PL, Kevin C, Joaquin G. Sperm and testis mediated DNA transfer as a means of gene therapy. Syst Biol Reprod Med 2011;57:35-42. 17. Kevin S, Corrado S. Sperm-mediated gene transfer: Applications and implications. BioEssays 2005;27:551-62. 18. Herrero MJ, Sabater L, Guenechea G, Sendra L, Montilla AI, Abargues R, et al. DNA delivery to 'ex vivo' human liver segments. Gene Ther 2011 in press. 19. Suhonen J, Ray J, Blömer U, Gage FH, Kaspar B. Ex vivo and in vivo gene delivery to the brain. Curr Protoc Hum Genet 2006;13:Unit 13.3. 20. Hu WW, Wang Z, Hollister SJ, Krebsbach PH. Localized viral vector delivery to enhance in situ regenerative gene therapy. Gene Ther 2007;14:891-901. 21. Takefumi S, Akira I, Shin E, Shiro B. In Situ Gene Therapy for Prostate Cancer. Curr Gene Ther 2005;5:111-9. 22. Davis PB, Cooper MJ. Vectors for airway gene delivery. AAPS J 2007;9:2. 23. 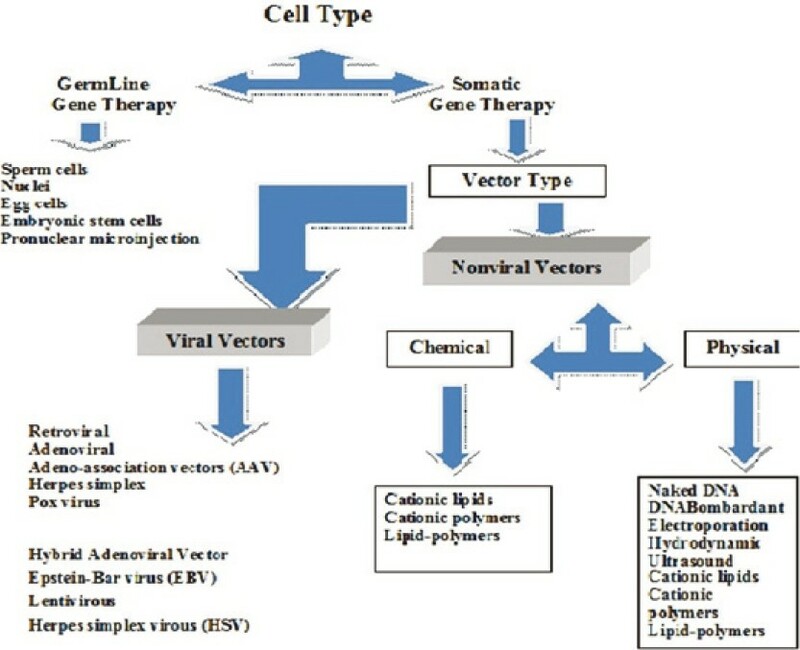 Huang Y, Liu X, Dong L, Liu Z, He X, Liu W. Development of Viral Vectors for Gene Therapy for Chronic Pain. Pain Res Treat 2011;2011:968218. 24. Gardlik R, Palffy R, Hodosy J, Lukacs J, Turna J, Celec P. Vectors and delivery systems in gene therapy. Med Sci Monit 2005;11:110-21. 25. Katare DP, Aeri V. Progress in gene therapy: A Review. I.J.T.P.R. 2010;1:33-41. 26. Wickham TJ. Ligand-directed targeting of genes to the site of disease. Nat Med 2003;9:135-9. 27. Anson DS. The use of retroviral vectors for gene therapy-what are the risks? A review of retroviral pathogenesis and its relevance to retroviral vector-mediated gene delivery. Genet Vaccines Ther 2004;2:9. 28. Frederic D. Bushman. Retroviral integration and human gene therapy. J Clin Invest 2007;117:2083-6. 29. Laufs S, Gentner B, Nagy KZ, Jauch A, Benner A, Naundrof S, et al. Retroviral vector integration occurs in preferred genomic targets of human bone marrow-repopulating cells. Blood 2003;101:2191-8. 30. Hacein-Bey-Abina S, Le Deist F, Carlier F, Bouneaud C, Hue C, De Villartay JP, et al. Sustained correction of X-linked severe combined immunodeficiency by ex vivo gene therapy. N Engl J Med 2002;346:1185-93. 31. Fischer A, Hacein-Bey-Aina S, Lagresle C, Garrigue A, Cavazanna-Calvo M. Gene therapy of severe combined immunodeficiency disease: Proof of principle of efficiency and safety issues. Gene therapy, primary immunodeficiencies, retrovirus, lentivirus, genome. Bull Acad Natl Med 2005;189:779-85. 32. Buckly RH. Gene therapy for SCID: A complication after remarkable progress. Lancet 2003;360:1185-6. 33. Fox JL. US authorities uphold suspension of SCID gene therapy. Nat Biotechnol 2003;21:217. 34. Hacein-Bey-Abina S, Von Kalle C, Schmidt M, McCormack MP, Wulffraat N, Leboulch P, et al. LMO2-associated clonal T cell proliferation in two patients after gene therapy for SCID-XI. Science 2003;302:415-9. 35. Thrasher AJ, Gaspar HB, Baum C, Modlich U, Schambach A, Candotti F, et al. Gene therapy: X-SCID transgene leukaemologenicity. Nature 2006;443:E5-7. 36. Vorburger SA, Hunt KK. Adenoviral Gene Therapy. Oncologist 2002;7:46-59. 37. Bett AJ, Prevec L, Graham FL. Packaging capacity and stability of human adenovirus type 5 vectors. J Virol 1993;67:5911-21. 38. Reid T, Warren R, Kirn D. Intravascular adenoviral agents in cancer patients: Lessons from clinical trials. Cancer Gene Ther 2002;9:979-86. 39. Raper SE, Chirmule N, Lee FS, Wivel NA, Bagg A, Gao GP, et al. Fatal systemic inflammatory response syndrome in a ornithine transcarbamylase deficient patient following adenoviral gene transfer. Mol Genet Metab 2003;80:148-58. 40. Marshall E. Gene therapy death prompts review of adenovirus vector. Science 1999;286:2244-5. 41. Teramato S, Ishii T, Matsuse T. Crisis of adenoviruses in human gene therapy. Lancet 2000;355:1911-2. 42. Lai CM, Lai YK, Rakoczy PE. Adenovirus and adeno-associated virus vectors. DNA Cell Biol 2002;21:895-913. 43. Flotte T, Carter B, Conrad C, Guggino W, Reynolds T, Rosenstein B, et al. A phase study of an adeno-associated virus-CFTR gene vector in adult CF patients with mild lung disease. Hum Gene Ther 1996;7:1145-59. 44. Kay MA, Manno CS, Ragni MV, Larson PJ, Couto LB, McClelland A, et al. Evidence for gene transfer and expression of factor IX in haemophilia B patients treated with an AAV vector. Nat Genet 2000;24:257-61. 45. Simonelli F, Maguire AM, Testa F, Pierce EA, Mingozzi F, Bennicelli JL, et al. Gene therapy for Leber's congenital amaurosis is safe and effective through 1.5 years after vector administration Molecular therapy. J Am Soc Gene Ther 2010;18:643-50. 46. Cideciyan AV, Hauswirth WW, Aleman TS, Kaushal S, Schwartz SB, Boye SL, et al. Vision 1 year after gene therapy for Leber's congenital amaurosis. N Engl J Med 2009;361:725-7. 47. Crane B, Luo X, Demaster A, Williams KD, Kozink DM, Zhang P, et al. Rescue administration of a helper dependent adenovirus vector with long-term efficacy in dogs with glycogen storage disease type Ia. Gene Ther 2011; in press. 48. Alba R, Bosch A, Chillon M. Gutless adenovirus: Last-generation adenovirus for gene therapy. Gene Ther 2005;12:18-S27. 49. Croyle MA, Le HT, Linse KD, Cerullo V, Toietta G, Beaudet A, et al. PEGylated helper-dependent adenoviral vectors: Highly efficient vectors with an enhanced safety profile. Gene Ther 2005;12:579-87. 50. Amalfitano A, Hauser MA, Hu H, Serra D, Begy CR, Chamberlain JS. Production and characterization of improved adenovirus vectors with the E1, E2b, and E3 genes deleted. J Virol 1998;72:926-33. 51. Morral N, O'Neal W, Rice K, Leland M, Kaplan J, Piedra PA, et al. Administration of helper-dependent adenoviral vectors and sequential delivery of different vector serotype for long-term liver-directed gene transfer in baboons. Proc Natl Acad Sci USA 1999;96:12816-21. 52. Balagué C, Zhou J, Dai Y, Alemany R, Josephs SF, Andreason G, et al. Sustained high-level expression of full-length human factor VIII and restoration of clotting activity in hemophilic mice using a minimal adenovirus vector. Blood 2000;95:820-8. 53. Morral N, Parks RJ, Zhou H, Langston C, Schiedner G, Quinones J, et al. High doses of a helper-dependent adenoviral vector yield supraphysiological levels of alpha1-antitrypsin with negligible toxicity. Hum Gene Ther 1998;9:2709-16. 54. Ehrhardt A, Yant SR, Giering JC, Xu H, Engler JA, Kay MA. Somatic Integration From an Adenoviral Hybrid Vector into a Hot Spot in Mouse Liver Results in Persistent Transgene Expression Levels In Vivo. Mol Ther 2007;15:146-56. 55. Shuji K, Kazunori H, Atsuko T, Donna JP, Philip N, Haruki O, et al. Adenovirus-retrovirus hybrid vectors achieve highly enhanced tumor transduction and antitumor efficacy in vivo. Mol Ther 2011;19:76-82. 56. Liu W, Liu Z, Cao X, Cao Z, Xue L, Zhu F, et al. Recombinant human foamy virus, a novel vector for neurological disorders gene therapy, drives production of GAD in cultured astrocytes. Mol Ther 2007;15:1834-41. 57. Mergia A, Heinkelein M. Foamy virus vectors. Curr Topics Microbiol Immunol 2003;277:131-59. 58. Trobridge GD. Foamy virus vectors for gene transfer. Exp Opin Biol Ther 2009;9:1427-36. 59. Liu W, Liu Z, Liu L, Xiao Z, Cao X, Cao Z, et al. A novel human foamy virus mediated gene transfer of GAD67 reduces neuropathic pain following spinal cord injury. Neurosci Lett 2008;432:13-8. 60. Burtton EA, Wechuck JB, Wendell SK, Goins WF, Fink DJ, Glorioso JC. Multiple applications for replication-defective Herpes simplex virus vectors. Stem Cell 2001;19:358-77. 61. Berto E, Bozac A, Marconi P. Development and application of replication incompetent HSV-1-based vectors. Gene Ther 2005;12:98-102. 62. Goins WF, Goss JR, Chancellor MB, de Groat WC, Glorioso JC, Yoshimura N. Herpes simplex virus vectormediated gene delivery for the treatment of lower urinary tract pain. Gene Ther 2009;16:558-69. 63. Wolfe D, Mata M, Fink DJ. A human trial of HSVmediated gene transfer for the treatment of chronic pain. Gene Ther 2009;16:455-60. 64. Goss JR, Harley CF, Mata M, O'Malley ME, Goins WF, Hu X, et al. Herpes vectormediated expression of proenkephalin reduces bone cancer pain. Ann Neurol 2002;52:662-5. 65. Goss JR, Mata M, Goins WF, Wu HH, Glorioso JC, Fink DJ. Antinociceptive effect of a genomic herpes simplex virus-based vector expressing human proenkephalin in rat dorsal root ganglion. Gene Ther 2001;8:551-6. 66. Lachmann RH, Efstathiou S. The use of Herpes simolex virus-based vectors for gene delivery to the nervous system. Mol Med Today 1997;3:404-11. 67. Federici T, Kutner R, Zhang XY, Kuroda H, Tordo N, Boulis NM, et al. Comparative analysis of HIV-1-based lentiviral vectors bearing lyssavirus glycoproteins for neuronal gene transfer. Genet Vaccines Ther 2009;7:1-9. 68. Cockrell AS, Kafri T. Gene delivery by lentivirus vectors. Mol Biotechnol 2007;36:184-204. 69. Kafri T. Gene delivery by lentivirus vectors an overview. Methods Mol Biol 2004;246:367-90. 70. Balaggan KS, Ali RR. Ocular gene delivery using lentiviral vectors. Gene Ther 2012;19:145-53. 71. Wong LF, Goodhead L, Prat C, Mitrophanous KA, Kingsman SM, Mazarakis ND. Lentivirus-Mediated Gene Transfer to the Central Nervous System: Therapeutic and Research Applications. Human Gen Ther 2006;17:1-9. 72. Azzouz M, Martin-Rendon E, Barber RD, Mitrophanous KA, Carter EE, Rohll JB, et al. Multicistronic lentiviral vector-mediated striatal gene transfer of aromatic L-amino acid decarboxylase, tyrosine hydroxylase, and GTP cyclohydrolase I induces sustained transgene expression, dopamine production, and functional improvement in a rat model of Parkinson's disease. J Neurosci 2002;22:10302-12. 73. Betchen SA, Kaplitt M. Future and current surgical therapies in Parkinson's disease. Curr Opin Neurol 2003;16:487-93. 74. Blesch A, Ynski MH. Gene therapy and cell transplantation for Alzheimer's disease and spinal cord injury. Yonsei Med J 2004;45:28-31. 75. Singer O, Marr RA, Rockenstein E, Crews L, Coufal NG, Gage FH, et al. Targeting BACE1 with siRNAs ameliorates Alzheimer disease neuropathology in a transgenic model. Nat Neurosci 2005;8:1343-9. 76. Moroziewicz D, Kaufman HL. Gene therapy with poxvirus vectors. Curr Opin Mol Ther 2005;7:317-25. 77. Gómez CE, Nájera JL, Krupa M, Esteban M. The poxvirus vectors MVA and NYVAC as gene delivery systems for vaccination against infectious diseases and cancer. Curr Gene Ther 2008;8:97-120. 78. Pastoret PP, Vanderplasschen A. Poxviruses as vaccine vectors. Comp Immunol Microbiol Infect Dis 2003;26:343-55. 79. Moss B. Genetically engineered poxviruses for recombinant gene expression, vaccination and safety. Proc Natl Acad Sci U S A 1996;93:11341-8. 80. McAneny D, Ryan CA, Beazley RM, Kaufman HL. Results of a phase I trial of a recombinant vaccinia virus that expresses carcinoembryonic antigen in patients with advanced colorectal cancer. Ann Surg Oncol 1996;3:395-500. 81. Borysiewicz LK, Fiander A, Nimako M, Man S, Wilkinson GW, Westmoreland D, et al. A recombinant vaccinia virus encoding human papillomavirus types 16 and 18, E6 and E7 proteins as immunotherapy for cervical cancer. Lancet 1996;347:1523-7. 82. Mecsas J, Sugden B. Replication of plasmids derived from bovine papilloma virus type 1 and Epstein-Barr virus in cell in culture. Annu Rev Cell Biol 1987;3:87-108. 83. Kishida T, Shin-Ya M, Imanishi J, Mazda O. Dept. of Microbiol., Kyoto Prefectural Univ. of Medicine Application of EBV-based artificial chromosome to genetic engineering of mammalian cells and tissues. Micro Nano Mechatron Hum Sci 2005;7-9:133-8. 84. Hirai H, Satoh E, Osawa M, Inaba T, Shimazaki C, Kinoshita S, et al. Use of EBV-based vector/ HVJ-liposome complex vector for targeted gene therapy of EBV-associated neoplasms. Biochem Biophys Res Commun 1997;241:112-8. 85. Robertson ES, Ooka T, Kieff ED. Epstein-Barr virus vectors for gene delivery to B lymphocytes. Proc Natl Acad Sci U S A. 1996;93:11334-40. 86. Audouny SA, Deleij LF, Hoekstra D, Molema G. In vivo characteristics of cationic liposomes as delivery vectors for gene therapy. Pharm Res 2002;19:1599-6005. 87. Varga CM, Hong K, Lanf Furburger DA. Quantitative analysis of synthesis gene delivery vector design properties. Mol Ther 2001;4:438-46. 88. Wolff JA, Ludtke JJ, Acsadi G, Williams P, Jani A. Long term persistence of plasmid DNA and foreign gene expression in mouse muscle. Hum Mol Genet 1992;1:363-9. 89. Knapp JE, Liu D. Hydrodynamic delivery of DNA. Methods Mol Biol 2004;245:245-50. 90. Herweijer H, Wolff JA. Progress and prospects: Naked DNA gene transfer and therapy. Gen Ther 2003;10:453-8. 91. Yang NS, Burkhorder J, Roberts B, Martinell B, McCabe D. In vivo and in vitro gene transfer to mammalian somatic cells by particle bombardment. Proc Natl Acad Sci USA 1990;87:9568-72. 92. Klein TM, Arentzen R, Lewis PA, Fitzpatrick McElligoutt S. Transformation of microbes, plants and animals by particle bombardment. Biotechnology 1992;10:286-91. 93. Cheng L, Ziegelhoffer PR, Yang NS. In vivo promoter activity and transgene expression in mammalian somatic tissues evaluated by using particle bombardment. Proc Natl Acad Sci USA 1993;90:4455-9. 94. Mahvi DM, Sheehy MJ, Yang NS. DNA cancer vaccines: A gene gun approach. Immunol Cell Biol 1997;75:456-60. 95. Heller LC, Ugen K, Heller R. Electroporation for targeted gene transfer. Expert Opin Drug Deliv 2005;2:255-68. 96. Lurquin PF. Gene transfer by electroporation. Mol Biotechnol 1997;7:5-35. 97. Potter H, Cooke SW. Gene transfer into adherent cells growing on microbeads. In: Change DC, editor. Guide to electroporation and electrofusion. San Diego, CA, USA: Academic Press; 1992. p. 201-8. 98. Neumann E, Schaefer-Ridder M, Wang Y, Hofschneider PH. Gene transferin to mouse lyoma cells by electroporation in high electric fields. EMBOJ 1982;1:841-5. 99. Dean DA, Machado Aranda D, Blair Parks K, Yeldandi AV, Young JL. Electroporation as a method for high level nonviral gene transfer to the lung. Gene Ther 2003;10:1608-15. 100. Mc Mahon JM, Wells DJ. Electroporation for gene transfer to skeletal muscles: Current status. Biol Drugs 2004;18:155-65. 101. Hatada S, Nikkuni K, Bentley SA, Kirby S, Smithies O. Gene correction in hematopoietic progenitor cells by homologous recombination. Proc Natl Acad Sci USA 2000;97:13807-11. 102. Hofmann GA, Dev SB, Nanda GS, Rabusssay D. Electroporation therapy of solid tumors. Crit Rev Ther Drug Carrier Syst 1999;16:523-69. 103. Gissel H, Clausen T. Excitation -induced Ca influx and skeletal muscle cell damage. Acta Physiol Scand 2001;171:327-34. 104. Liu F, Song Y, Liu D. Hydrodynamics-based transfection in animals by systemic administration of plasmid DNA. Gene Ther 1999;10:1258-66. 105. Miao CH, Ye X, Thompson AR. High level factor VIII gene expression in vivo achieved by nonviral liver-specific gene therapy vectors. Hum Gen Ther 2003;14:1297-305. 106. Jiang J, Yamato E, Miyazaki J. Intravenous delivery of naked plasmid DNA for in vivo cytokine expression. Biochem Biophys Res Commun 2001;289:1088-92. 107. Maruyama H, Higuchi N, Kameda S, Miyazaki J, Gejyo F. Rat liver targeted naked plasmid DNA transfer by tail vein injection. Mol Biotechnol 2004;26:165-72. 108. Yang J, Chen S, Huang L, Michalopoulos GK, Liu Y. Sustained expression of naked plasmid DNA encoding hepatocyte growth factor in mice promotes liver and overall body growth. Hepatology 2001;33:848-59. 109. Kim HJ, Greeenleaf JF, Kinnick RR, Bronk JT, Bolander ME. Ultrasound-mediated transfection of mammalian cells. Hum Gene Ther 1996;7:1339-46. 110. Liang HD, Lu QL, Xue SA, Halliwell M, Kodama T, Cosgrove DO, et al. Optimisation of ultrasound mediated gene transfer (sonoporation) in skeletal muscle cells. Ultrasound Med Biol 2004;30:1523-9. 111. Plank C, Schillinger U, Scherer F, Bergemann C, Rémy JS, Krötz F, et al. The magnetofection method: Using magnetic force to enhance gene delivery. Biol Chem 2003;384:737-47. 112. Scherer F, Anton M, Schillinger U, Henke J, Bergemann C, Krüger A, et al. Magnetofection: Enhancing and targeting gene delivery by magnetic force in vitro and in vivo. Gene Ther 2002;9:102-9. 113. Plank C, Anton M, Rudolph C, Rosenecker J, Krötz F. Enhancing and targeting nucleic acid delivery by magnetic force. Exp Opin Biol Ther 2003;3:745-58. 114. Mair L, Ford K, Alam MR, Kole R, Fisher M, Superfine R. et al. Size-Uniform 200 nm Particles: Fabrication and Application to Magnetofection. J Biomed Nanotechnol 2009;5:182-91. 115. Liu D, Ren T, Gao X. Cationic transfection lipids. Curr Med Chem 2003;10:1735-7. 116. Zhang S, Xu Y, Wang B, Qiao W, Liu D, Li Z. Cationic compounds used in lipoplexes and polyplexes for gene delivery. J Controlled Release 2004;100:165-80. 117. Khalil IA, Kogure K, Akita H, Harashima H. Uptake pathways and subsequent intracellular trafficking in nonviral gene delivery. Pharmacol Rev 2006;58:32-45. 118. Boeckle S, Wagner E. Optimizing targeted gene delivery: Chemical Modification of viral vectors and synthesis of artificial virus vector systems. AAPS J 2006;8:Article 83. 119. Kim TG, Kang SY, Kang JH, Cho MY, Kim JI, Kim SH, et al. Gene transfer into human hepatoma cells by receptor-associated protein/polylysine conjugates. Bioconjug Chem 2004;15:326-32. 120. Wolschek MF, Thallinger C, Kursa M, Rössler V, Allen M, Lichtenberger C, et al. Specific systemic nonviral gene delivery to human hepatocellular carcinoma xenografts in SCID mice. Hepatology 2002;36:1106-14. 121. Xu L, Pirollo KF, Tang WH, Rait A, Chang EH. Transferrin-liposome-mediated systemic p53 gene therapy in combination with radiation results in regression of human head and neck cancer xenografts. Hum Gene Ther 1999;10:2941-52. 122. Chiu SJ, Ueno NT, Lee RJ. Tumor-targeted gene delivery via anti-HER2 antibody (trastuzumab, Herceptin) conjugated polyethylenimine. J Control Release 2004;97:357-69. 123. Zhang Y, Zhang YF, Bryant J, Charles A, Boado RJ, Pardridge WM. Intravenous RNA interference gene therapy targeting the human epidermal growth factor receptor prolongs survival in intracranial brain cancer. Clin Cancer Res 2004;10:3667-77. 124. Hood JD, Bednarski M, Frausto R, Guccione S, Reisfeld RA, Xiang R, et al. Tumor regression by targeted gene delivery to the neovasculature. Science 2002;296:2404-7. 125. Plank C, Zatloukal K, Cotton M, Mechtler K, Wagner E. Gene transfer into hepatocytes using asialoglycoprotein receptor-mediated endocytosis of DNA complexed with an artificial tetra-antennary galactose ligand1. Bioconjug Chem 1992;3:533-9. 126. Ziandy AG, Ferkol T, Dawson DV, Perlmutter DH, Davis PB. Chain length of the polylysine in receptor-targeted gene transfer complexes affects duration of reporter gene expression both in vitro and in vivo. 1999;274:4908-16. 127. Hofland HE, Masson C, Iginla S, Osetinsky I, Reddy JA, Leamon CP, et al. Folate-targeted gene transfer in vivo. Mol Ther 2002;5:739-44. 128. Son KK, Tkaeh D, Hall KJ. Efficient in vivo gene delivery by the negatively charged complexes of cationic liposome and plasmid. DNA Biochem Biophys Acta 2000;1468:6-10. 129. Mastrobattista E, Koning GA, van Bloois L, Filipe AC, Jiskoot W, Storm G. Functional characterization of an endosome-disruptive peptide and its application in cytosolic delivery of immunoliposome-entrapped proteins. J Biol Chem 2002;277:27135-43. 130. Schnyder A, Huwyler J. Drug transport to brain with targeted liposomes. NeuroRx 2005;2:99-107. 131. Immordino ML, Dosio F, Cattel L. Stealth liposomes: Review of the basic science, rationale, and clinical applications, existing and potential. Int J Nanomed 2006;1:297-315. 132. Chen C, Han D, Cai C, Tang X. An overview of liposome lyophilization and its future potential. J Control Release 2010;142:299-311. 133. Stenekes RJ, Loebis AE, Fernandes CM, Crommelin DJ, Hennink WE. Controlled release of liposomes from biodegradable dextran microspheres: A novel delivery concept. Pharm Res 2000;17:690-5. 134. Felgner PL, Gadek TR, Holm M, Roman R, Chan HW, Wenz M, et al. Lipofection: A highly efficient, lipid-mediated DNA-transfection procedure. Proc Natl Acad Sci USA 1987;84:7413-7. 135. Cullis PR, Hope MJ, Tilcock CP. Lipid polymorphism and the roles of lipids in membranes. Chem Phys Lipds 1986;40:127-44. 136. Wrobel I, Collins D. Fusion of cationic liposomes with mammalian cells occurs after endocytosis. Biochem Biophys Acta 1995;1235:296-304. 137. Schwartz B, Benoist C, Abdallah B, Scherman D, Behr JP, Demeneix BA. Liposopermine-based gene transfer into the newborn mous brain is optimized by a low lipospermine DNA charge ratio. Hum Gene Ther 1995;6:1515-24. 138. Liu F, Qi H, Huang L. Overcoming the inhibitory effect of serum on lipofection by increasing the charge ratio of cationic liposome to DNA. Gene Ther 1997;4:517-23. 139. Yang JP, Huang L. Overcoming the inhibitory effect of serum on lipofection by increasing the charge ratio of cationic liposome to DNA. Gene Ther 1995;92:1744-1748. 140. Felgner JH, Kumar R, Sridhar CN, Wheeler CJ, Tsai YJ, Border R, et al. Enhanced gene delivery and mechanism studies with a novol series of cationic lipid formulations. J Biol Chem 1994;269:2550-61. 141. Alton EW, Middleton PG, Caplen NJ, Smith SN, Steel DM, Munkonge FM, et al. Non-invasive liposome mediated gene delivery can correct the ion transport defect in cystic fibrosis mutant mice. Nat Gent 1993;5:135-42. 142. McQuillin A, Murray KD, Etheridge CJ, Stewart L, Cooper RG, Brett PM, et al. Optimization of liposome mediated transfection of a neuronal cell line. 1997;8:135-42. 143. Fife K, Bower M, Cooper RG. Endothelial cell transfection with cationic liposomes and herpes simolex-thymidine kinase mediated killing. Gen Ther 1998;5:614-20. 144. Birchall JC, Kellawy IW, Mills SN. Physicochemical characterization and transfection efficiency of lipid-based gene delivery complexes. Int J Pharm 1999;183:195-207. 145. Stribling R, Brunette E, Liggitt D, Gaensler K, Debs R. Aerosol gene delivery in vivo. Proc Natl Acad Sci USA 1992;89:11277-81. 146. Caplen NJ, Alton EW, Middleton PG, Dorin JR, Stevenson BJ, Gao X, et al. Liposome-mediated CFTR gene transfer to the nasal epithelium of patients with cystic fibrosis. Nat Med 1995;1:39-46. 147. Alton EW, Stern M, Farley R, Jaffe A, Chadwick SL, Phillips J, et al. Cationic lipid mediated CFTR gene transfer to the lungs and nose of patients with cystic fibrosis: A double blind placebo-controlled trial. Lancet 1999;353:947-54. 148. Zhu N, Liggitt D, Liu Y, Debs R. Systemic gene expression after intravenous DNA delivery into adult mice. Science 1993;261:209-11. 149. Rogy MA, Auffenberg T, Espat NJ, Philip R, Remick D, Wollenberg GK, et al. Human tumor necrosis factor receptor(p55) and interleukin 10 gene transfer in the mouse reduces mortality to the lethal endotoxemia and also attenuates local inflammatory responses. J Exp Med 1995;181:2289-93. 150. Murray KD, McQuillin A, Stewart L, Etheridge CJ, Cooper RG, Miller AD, et al. Cationic liposome mediated DNA transfection in organotype explant cultures of the ventral mesencephalon. Gene Ther 1999;6:190-7. 151. Thierry AR, Lunardiskander Y, Bryant JL, Rabinovich P, Gallo RC, Mahan LC. Systemic gene therapy: Biodistribution and long term expression of a transgene in mice. Proc Natl Acad Sci USA 1995;92:9742-6. 152. Immordino ML, Dosio F, Cattel L. Stealth liposomes: Review of the basic science, rationale, and clinical applications, existing and potential. Int J Nanomed 2006;1:297-315. 153. Bharali DJ, Khalil M, Gurbuz M, Simone TM, Mousa SA. Nanoparticles and cancer therapy: A concise review with emphasis on dendrimers. International. J Nanomed 2009;4:1-7. 154. Kim ES, Lu C, Khuri FR, Tonda M, Glisson BS, Liu D, et al. A phase II study of STEALTH cisplatin (SPI-77) in patients with advanced nonsmall cell lung cancer. Lung Cancer 2001;34:427-32. 155. Goyal P, Goyal K, Kumar SG, Singh A, Katare OP, Mishra DN. Liposomal drug delivery systems-clinical applications. Acta Pharm 2005;55:1-25. 156. Pradhan P, Giri J, Rieken F, Koch C, Mykhaylyk O, Döblinger M, et al. Targeted temperature sensitive magnetic liposomes for thermo-chemotherapy. J Control Release 2010;1:108-21. 157. Boussif O, Lezoualc'h F, Zanta MA, Mergny MD, Scherman D, Demeneix B, et al. A versatile vector for gene and oligonucleotide transfer into cells in culture and in vivo: Polyethylenamine. Proc Natl Acad Sci USA 1995;92:7297-301. 158. Martin ME, Rice KG. Peptide-guided Gene Delivery. AAPS J 2007;9:Article 3. 159. Wolfert MA, Saymour LW. Atomic force microscopic analysis of the influence of the molecular weight of poly(L)lysine on the size of polyelectrolyte complexes formed with DNA. Gen Ther 1996;3:269-73. 160. El-Aneed A. An overview of current delivery systems in cancer gene therapy. J Control Release 2004;94:1-14. 161. Tang MX, Szoka FC. The influence of polymer structure on the interactions of cationic polymers with DNA and morphology of the resulting complexes. Gene Ther 1997;4:823-32. 162. Wadhwa MS, Collard WT, Adami RC, McKenzie DL, Rice KG. Peptide-mediated gene delivery: Influence of peptide structure on gene expression. Bioconjug Chem 1997;8:81-8. 163. McKenzie DL, Collard WT, Rice KG. Comparative gene transfer efficiency of low molecular weight polylysine DNA-condensing peptides. J Pept Res 1999;54:311-8. 164. Adami RC, Collard WT, Gupta SA, Kwok KY, Bonadio J, Rice KG. Stability of peptide-condensed Plasmid DNA formulations. J Pharm Sci 1998;87:678-83. 165. Plank C, Tang MX, Wolfe AR, Szoka FC. Branched cationic peptides for gene delivery: Role of type and number of cationic residues in formation and in vitro activity of DNA polyplexes. Hum Gene Ther 1999;10:319-32 . 166. Wightman L, Kircheis R, Rössler V, Carotta S, Ruzicka R, Kursa M, et al. Different behavior of the branched and linear polyethylenamine for gene delivery in vitro and in vivo. J Gene Med 2000;3:362-72. 167. Zanta MA, Boussif O, Adib A, Behr JP. In vitro gene delivery to hepatocytes with galactosylenimine. Bioconjugate Chem 1997;8:839-44. 168. Kircheis R, Kichler A, Wallner G, Kursa M, Ogris M, Felzmann T, et al. Coupling of cell binding ligands to polyethylenimine for targeted gene delivery. Gene Ther 1997;4:409-18. 169. Erbacher P, Remy JS, Behr JP. Gene transfer with synthetic virus like particles via the integrin mediated endocytosis pathway. Gene Ther 1999;6:138-45. 170. Tang MX, Szoka FC. The influence of polymer structure on the interaction of cationic polymers with DNA and morphology of the resulting complexes. Gene Ther 1997;4:823-32. 171. Fischer D, Li Y, Ahlemeyer B, Krieglstein J, Kissel T. In vitro cytotoxicity testing of polycations: Influence of polymer structure on cell viability and hemolysis. Biomaterials 2003;24:1121-31. 172. Fischer D, Bieber T, Li Y, Elasser HP, Kissel T. A novel non-viral vector for DNA delivery based on low molecular weight, branched polyethylenamine: Effect of molecular weight on transfection efficiency and cytotoxicity. Pharm Res 1999;16:1273-9. 173. Lim YB, Han SO, Kong HU. Biodegradable polyester, poly[alpha-(4-aminobutyl)-L-glycolic acid], as anon-toxic gene carrier. Pharm Res 2000;7:811-6. 174. Gao X, Huang L. Potentiation of cationic liposome-mediated gene delivery by polycationics. Biochemistry 1996;35:1027-36. 175. Lee RJ, Huang L. Folate-targeted, anionic liposome-entrapped polylysine-condensed DNA for tumor cell-specific gene transfer. J Biol Chem 1996;271:8481-7. 176. Lee LK, Williams CL, Devore D, Roth CM. Poly (eropylacrylicacid) enhances cationic lipid-mediated delivery of antisense oligonucleotides. Biomacromolecules 2006;7:1502-8. 177. Maguire AM, Simonelli F, Pierce EA, Pugh EN, Mingozzi F, Bennicelli J, et al. Safety and efficacy of gene transfer for Leber's congenital amaurosis. N Engl J Med 2008;358:2240-8. 178. Simonelli F, Maguire AM, Testa F, Pierce EA, Mingozzi F, Bennicelli JL, et al. Gene therapy for Leber's congenital amaurosis is safe and effective through 1.5 years after vector administration Molecular therapy. J Am Soc Gene Ther 2010;18:643-50. 179. Cideciyan AV, Hauswirth WW, Aleman TS, Kaushal S, Schwartz SB, Boye SL, et al. Vision 1 year after gene therapy for Leber's congenital amaurosis. N Engl J Med 2009;361:725-7. 180. Cartier N, Aubourg P. Hematopoietic Stem Cell Transplantation and Hematopoietic Stem Cell Gene Therapy in X-Linked Adrenoleukodystrophy. Brain Pathol 2010;20:857-862. 181. LeWitt PA, Rezai AR, Leehey MA, Ojemann SG, Flaherty AW, Eskandar EN, et al. AAV2-GAD gene therapy for advanced Parkinson's disease: A double-blind, sham-surgery controlled, randomised trial. Lancet Neurol 2011;10:309-19. 13 ?????????????? ??????????? ?????? ?????? ??? ????????? ??? ???????? ??????????? ?????? ? ?????? ?. ?. ???????,?. ?. ???????,?. ?. ????????,?. ?. ??????????,?. ?. ?????????,?. ?. ?????????,?. ?. ???????????,?. ?. ???????,?. ?. ?????? 45 Comparison of random and gradient amino functionalized poly(2-oxazoline)s: Can the transfection efficiency be tuned by the macromolecular structure? 86 The evolution of heart failure with reduced ejection fraction pharmacotherapy: What do we have and where are we going?